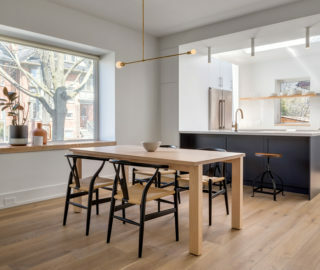 When trained architect, film professional and golden retriever owner, P, wanted a secluded place to work in his Christie Pitts backyard, he tasked local firm Anya Moryoussef Architect with transforming his rusty garage into a light-filled, inspiring home office. But his brief didn’t end there. 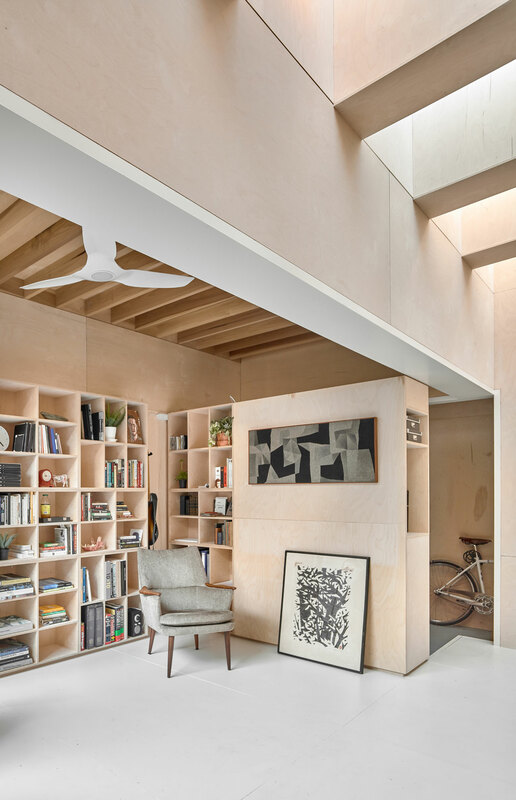 “He also wanted room to store files, bicycles, and display a collection of modern art, antiquarian books, and nautical models,” says Moryoussef. 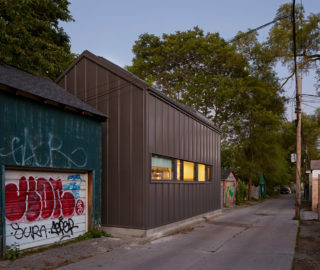 So basically, a studio for all seasons — and something completely different from the existing laneway garage. 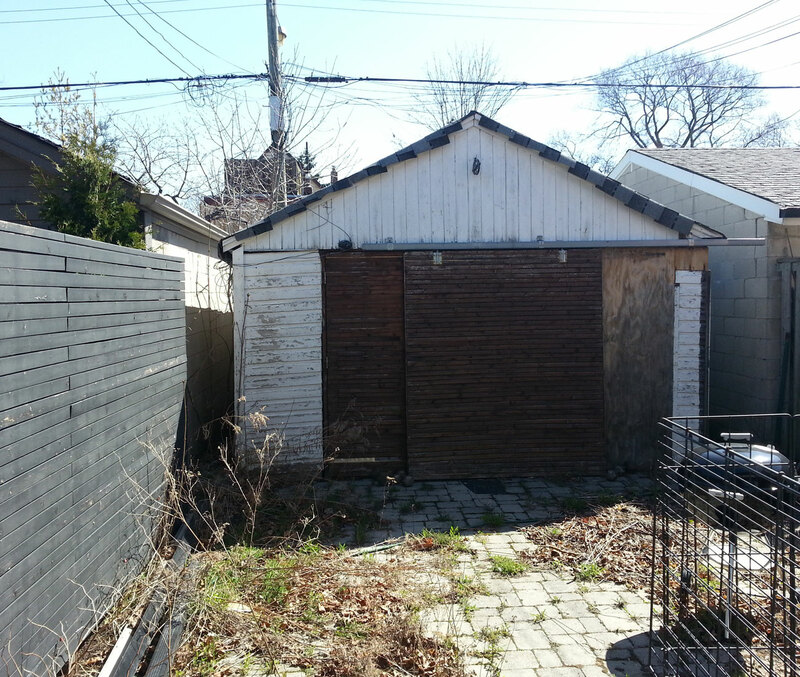 The west-facing garage with laneway access was used for storage pre-renovation. Fittingly, Moryoussef and her client looked to Renaissance Italy for inspiration. They had both been taken, as architecture students, by the studiolo at the Ducal Palace in Gubbio. 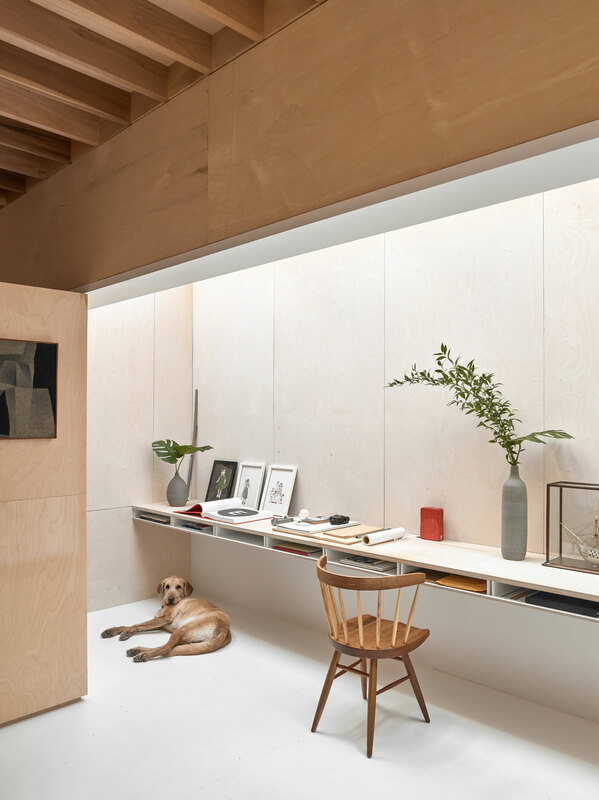 This private study, the architect recounts, “is a series of rooms inside rooms — some actual, some trompe-l’œil.” And so, she sought to infuse the same illusionism and depth into the west end studio, with warm wood panelling alternately camouflaging and delineating private spaces. 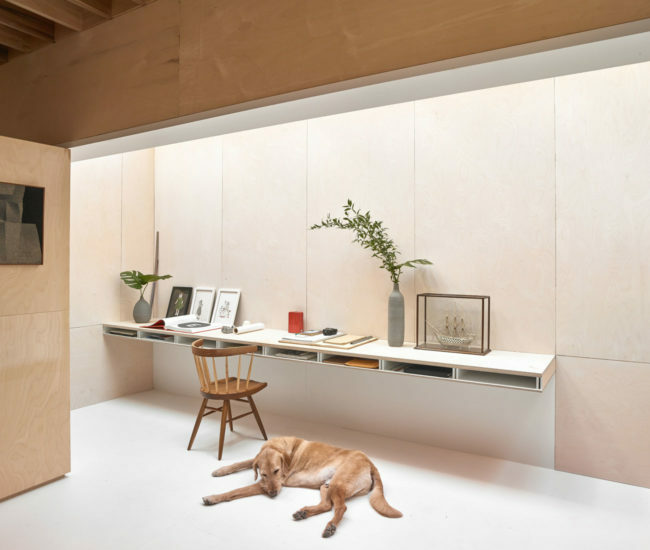 Ollie lounges under the 5.5 metre-long desk, where his owner often writes and reads film scripts. The courtyard was conceived as an extension of the house – another room in a series of rooms. 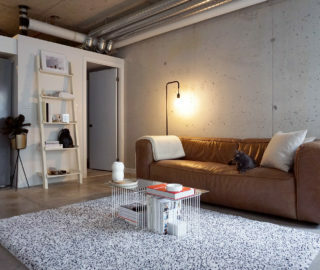 Whereas Renaissance-era architecture conjures close, candle-lit rooms, P’s study is airy and filled with natural light. 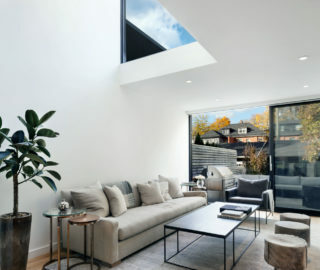 Sunshine streams in through a picture-frame window from Alumicor and a series of Velux skylights that illuminate the 5.5 metre-long desk below. This is where P writes and reviews scripts, sketches and, we imagine, dreams up characters and plots. An inconspicuous entryway behind the desk opens onto the garden, which was itself conceived as another room (an idea the architect also explored in this semi-private backyard patio project). 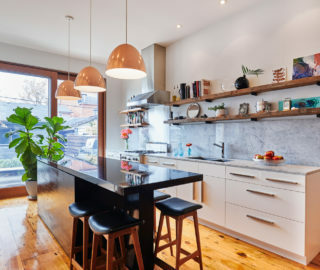 “The fluid interconnections,” Moryoussef remarks, “create a sense of constantly unfolding space, which produces a sense of intimacy and expansiveness.” Here, you have to fully round a corner to know how much space lies ahead. A vintage chair stands against a backdrop of books, modern art and decor. 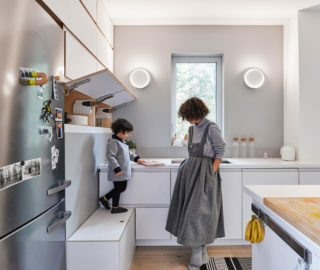 Not surprisingly, cladding the 30-square-metre building in plywood required a carpenter with an experienced hand. Thanks to his training, however, P was able build his own bookcase, saving money on labour. And, according to the architect, he was an ideal client in other ways as well. 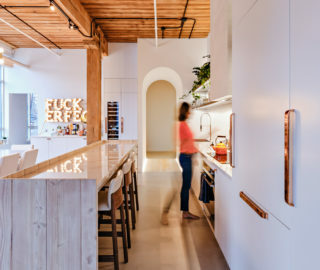 He “trusted the capacity of excellent design to create an environment he himself couldn’t quite picture.” That pushed Moryoussef and her team, in turn, to pursue a bolder vision for what a backyard studio in Toronto could look like. 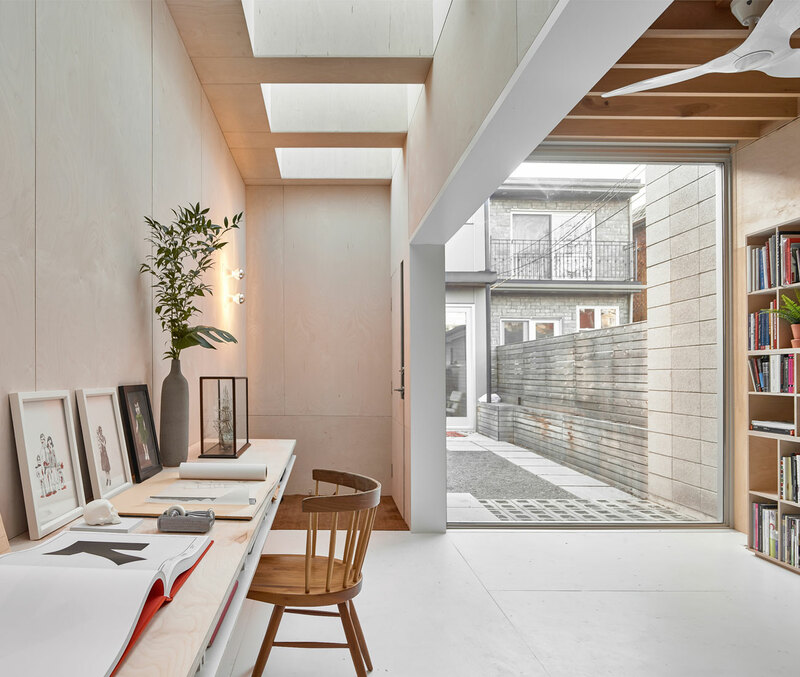 By cladding the exterior with domestic tiles from InaxJapan, the architecture firm underscored the sense of being inside another room in the courtyard. This shines through in the study’s textured facade. 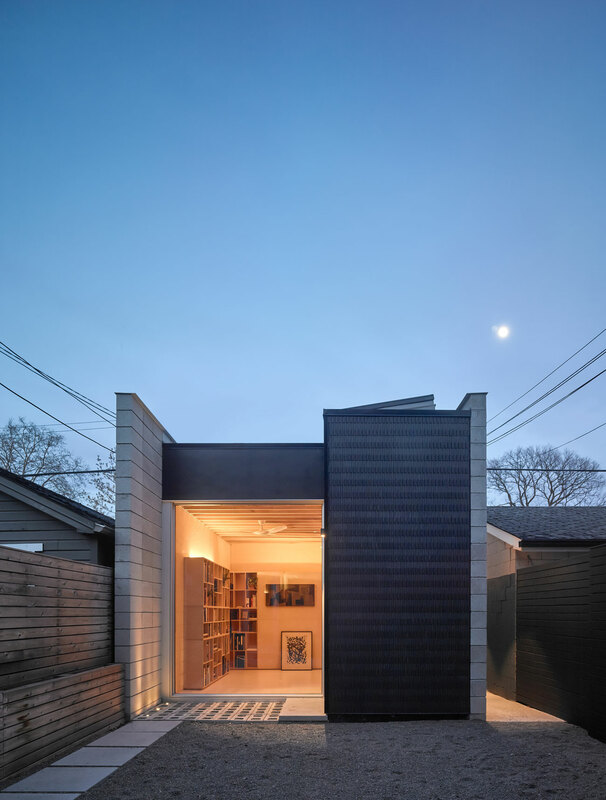 Although the structure and cladding are made of standard concrete blocks (supplied by Brampton Brick), the black vertical strip facing the main house is composed of porcelain mosaic tiles from Japan. Normally found inside the home, this domestic material underscores the feeling of being indoors, even in the courtyard. For another inspiring backyard studio project, check out How an Architect Dad DIYed a Dream Garden Studio.